Jason Trelewicz has been interested in the field of materials science since he was a young child, when his father — an engineer — would bring him to work. In the materials lab at his father’s workplace, Trelewicz would zoom in on material surfaces by using optical microscopes, intrigued by all the unique features he would see as light interacted with different samples. Trelewicz, currently an assistant professor in the College of Engineering and Applied Sciences’ Department of Materials Science and Chemical Engineering with a joint appointment in the Institute for Advanced Computational Science at Stony Brook University and principal investigator of the Engineered Metallic Nanostructures Laboratory, takes advantage of the much greater magnifications of electron microscopes in order to observe small nanostructures in great detail and then learn what happens when they are exposed to radiation, heat, and mechanical forces. To be more specific, Trelewicz is interested in nanostructured metal alloys (metals that are mixed with other elements) that include nanometer-sized features into classical materials to improve their performance. The information gathered from electron microscopy studies allows him to comprehend interactions between chemical and structural features at the nanoscale. It is then possible to apply this understanding for tuning the properties of materials for use in everything from automotive and aerospace components to nuclear reactors and consumer electronics. 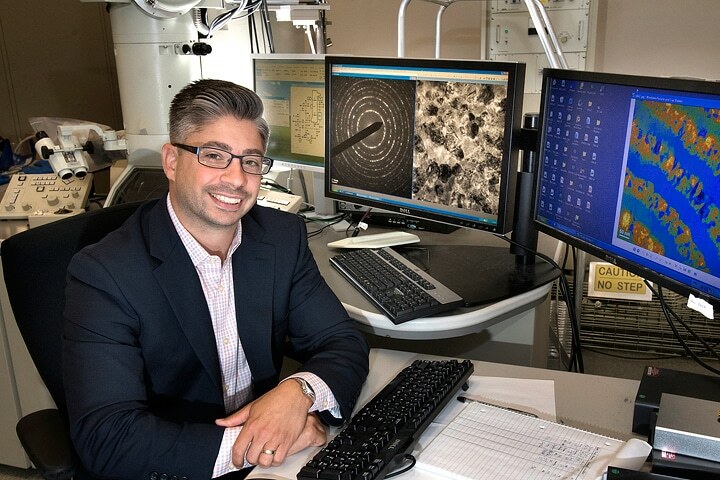 Since 2012, when he arrived at Stony Brook University, Trelewicz has been employing electron microscopes and the high-performance computing (HPC) cluster at the Center for Functional Nanomaterials (CFN) — a U.S. Department of Energy (DOE) Office of Science User Facility at Brookhaven National Laboratory — in order to carry out his research. At the time, I was looking for ways to apply my idea of stabilizing nanostructures in metals to an application-oriented problem, I’ve long been interested in nuclear energy technologies, initially reading about fusion in grade school. The idea of recreating the processes responsible for the energy we receive from the sun here on earth was captivating, and fueled my interest in nuclear energy throughout my entire academic career. Though we are still very far away from a fusion reactor that generates power, a large international team on a project under construction in France called ITER is working to demonstrate a prolonged fusion reaction at a large scale. Nuclear fusion, the reaction in which atomic nuclei collide, is capable of providing a nearly unlimited supply of clean, safe energy, like that naturally generated by the sun via fusing hydrogen nuclei into helium atoms. Harnessing this carbon-free energy in reactors needs producing and then sustaining a plasma, an ionized gas, at extremely high temperatures which fusion occurs at (about six times hotter than the core of the sun) while confining it using magnetic fields. Of the many challenges presently facing fusion reactor demonstrations, one of specific interest to Trelewicz is developing viable materials to build a reactor. The formidable materials challenges for fusion are where I saw an opportunity for my research—developing materials that can survive inside the fusion reactor, where the plasma will generate high heat fluxes, high thermal stresses, and high particle and neutron fluxes, the operational conditions in this environment are among the harshest in which one could expect a material to function. Tungsten is a primary candidate for such “plasma-facing material” due to its high melting point — the highest one among metals in pure form — and low sputtering yield (number of atoms ejected by energetic ions from the plasma). However, tungsten’s stability against oxidation resistance, long-term radiation tolerance, recrystallization, and mechanical performance are problematic. Trelewicz assumes that designing tungsten alloys with exactly customized nanostructures could be a way to overcome these issues. In August, he received a $750,000 five-year award from the DOE’s Early Career Research Program in order to develop stable nanocrystalline tungsten alloys capable of withstanding the demanding environment of a fusion reactor. His research is incorporating simulations that model atomic interactions and experiments dealing with real-time ion irradiation exposure and mechanical testing in order to understand the basic mechanisms responsible for the alloys’ thermal stability, mechanical performance and radiation tolerance. The understandings from this research will help in designing more resilient alloys for fusion applications. Besides the computational resources they use at their home institution, Trelewicz and his lab group are employing the HPC cluster at the CFN — and those at other DOE facilities, such as Titan at Oak Ridge Leadership Computing Facility (a DOE Office of Science User Facility at Oak Ridge National Laboratory) — to carry out large-scale atomistic simulations as part of the project. The length scales of the structures we want to design into our materials are on the order of a few nanometers to 100 nanometers, and a single simulation can involve up to 10 million atoms, using HPC clusters, we can build a system atom-by-atom, representative of the structure we would like to explore experimentally, and run simulations to study the response of that system under various external stimuli. For example, we can fire a high-energy atom into the system and watch what happens to the material and how it evolves, hundreds or thousands of times. Once damage has accumulated in the structure, we can simulate thermal and mechanical forces to understand how defect structure impacts other behavior. These simulations inform the chemistries and structures of experimental alloys, which Trelewicz and his students fabricate at Stony Brook University via high-energy milling. To characterize the nanoscale structure and chemical distribution of the engineered alloys, they widely use the microscopy facilities at the CFN — including transmission electron microscopes, scanning electron microscopes, and scanning transmission electron microscopes. Imaging is performed at high resolution and frequently combined with heating within the microscope in order to examine in real time how the structures evolve with temperature. Experiments are also performed at other DOE national labs, such as Sandia by collaborating with materials scientist Khalid Hattar of the Ion Beam Laboratory. Here, students in Trelewicz’s research group irradiate the engineered alloys with an ion beam simultaneously and also image them with an electron microscope over the course of many days. Electron microscopy at the CFN has played a vital role in an exciting discovery that Trelewicz’s students recently made: an unexpected metastable-to-stable phase transition in thin films of nanostructured tungsten. This phase transition motivates an abnormal "grain” growth process in which some crystalline nanostructure features grow extremely dramatically at the expense of others. When the students added titanium and chromium to tungsten, this metastable phase was totally eliminated, in turn improving the thermal stability of the material. The research with tungsten is just one of many projects ongoing in the Engineered Metallic Nanostructures Laboratory. Through a National Science Foundation CAREER (Faculty Early Career Development Program) award, Trelewicz and his research group are investigating another class of high-strength alloys, called amorphous metals, or “metallic glasses,” which refers to metals that have a disordered atomic structure akin to glass. Compared to normal metals, metallic glasses are frequently inherently higher strength but normally extremely brittle, and it is difficult to make them in huge parts such as bulk sheets. Trelewicz’s team is designing interfaces and also engineering them into the metallic glasses — initially iron-based and later zirconium-based ones — in order to enhance the toughness of the materials, and discovering additive manufacturing processes to enable sheet-metal production. They will make use of the Nanofabrication Facility at the CFN in order to fabricate thin films of these interface-engineered metallic glasses for in situ analysis employing electron microscopy techniques. In a similar project, they are striving to comprehend how introducing a crystalline phase into a zirconium-based amorphous alloy to develop a metallic glass matrix composite (made up of both crystalline and amorphous phases) augments the deformation process relative to that of normal metallic glasses. Metallic glasses generally fail catastrophically since strain becomes localized into shear bands. Introducing crystalline regions in the metallic glasses could hinder the process by which strain localizes in the material. They have already showed that the existence of the crystalline phase fundamentally modifies the mechanism through which the shear bands develop. Trelewicz and his group are also investigating the deformation behavior of metallic “nanolaminates” that comprise of alternating amorphous and crystalline layers, and are attempting to approach the theoretical limit of strength in lightweight aluminum alloys via synergistic chemical doping strategies (incorporating other elements to a material in order to change its properties). Besides his work at CFN, Trelewicz partners with his departmental colleagues in order to characterize materials at the National Synchrotron Light Source II — another DOE Office of Science User Facility at Brookhaven. Trelewicz is busy with student outreach when he is not doing research. He connects with the technology departments at different schools, providing them with materials engineering design projects. The students participate in the engineering aspects of materials design and are also trained on how to make use of 3D printers and various other tools that are vital in today’s society in order to manufacture products with better performance and more cost effectively. In the future, Trelewicz aims at expanding his collaborations at the CFN and establishing his research in metallic nanostructures as a key area supported by CFN and, eventually, DOE, in order to achieve unparalleled properties in classical materials.